Today marks the 5 week countdown until Memorial Day Murph workout and BBQ (details to come)!! The programming is going to be geared towards preparing yourself for the three movements and the runs. 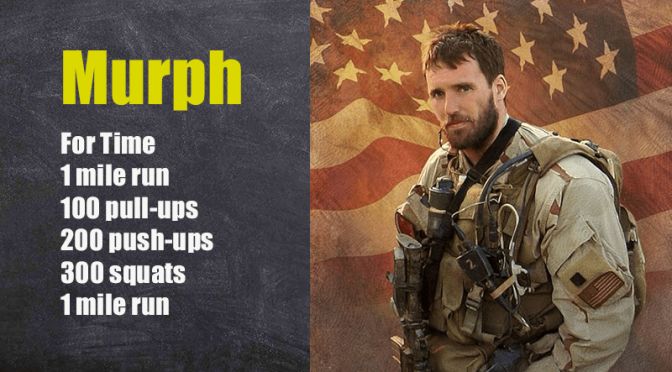 Take these 5 weeks and push yourself, so you can either beat or set a new Murph PR!! Remember as always have fun, this is a great workout and one of my favorites!! *At 17:00 start part 2. Today is an active recovery day. Take some time to work on mobility and stretch out what feels sore! Great work everyone on yesterdays WOD!! The goal is to practice handstand skills, post workout, in an environment where there is no rushing to complete the movements. Rest as needed between reps/movements to ensure high quality. The goal is not extra fatigue, but rather skill and control. Athletes can mix these movement into the rest intervals on the row section as desired.